Travel to Milan via Bergamo / Orio al Serio Airport and benefit from competitive rates on car hire available on Cartrawler search engine. Cartrawer search engine partners with many rent-a-car companies, facilitating an exhaustive yet not time-consuming price comparison and an online booking. The iconic Fiat 500 is one of the smallest rental cars, often available in the fleets of Italian car rental companies. For a long time Bergamo Airport, officially referred to as Aeroporto di Bergamo Orio al Serio – BGY was Milan’s smallest airport, in terms of passenger traffic. Recently, however, thanks to the growth of low-cost operations in Bergamo, mainly from the Irish carrier Ryanair, the airport became number 2 when it comes to air travel to Milan and number 3 on the scale of the whole country. In 2016 Bergamo Airport served over 11 million passengers, a large part of them Ryanair customers. Ryanair operates over 70 routes at Bergamo, using ‘Milan-Bergamo Airport’ name for marketing purposes. 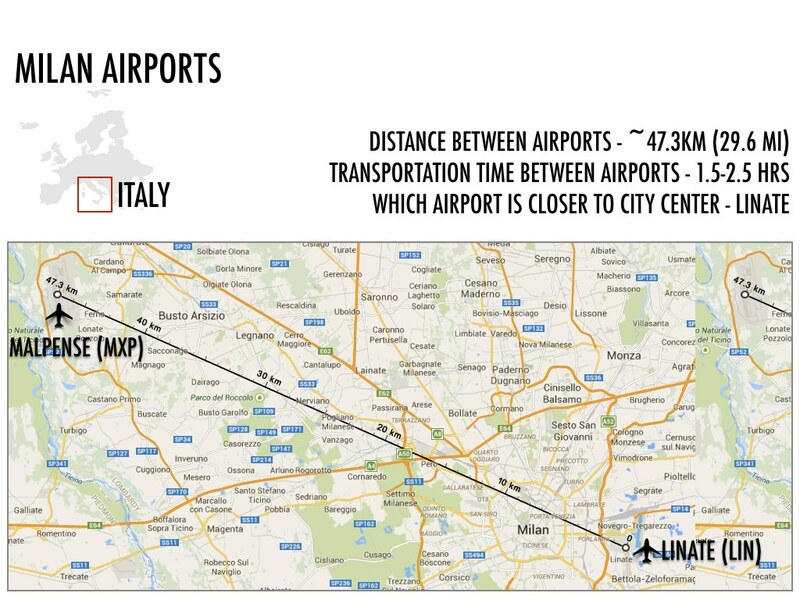 If you are travelling to Milan via Bergamo, be advised that the distance between the airport and Milan city centre is approximately 38 miles (one hour by car). Although the majority of passengers landing at Bergamo Airport are destined to Milan, the airport is also conveniently located for those travelling to Lake Como area or to the ski resorts of the Italian Alps. In the 1.5-2 hours distance by car from Bergamo several cities relevant for tourism are located. The list of the road distances from Bergamo Airport can be found further below in the article. The distance from the airport to Bergamo city centre is approximately 3 miles. See map of other Milan airports situated closer to the city centre. The choice of Bergamo Airport rent-a-car providers is vast and includes both international and local companies. Cartrawler search engine displays offers from: Hertz, Six, Alamo, Budget, Europcar, Dollar, Thrifty, Maggiore, Goldcar, Firefly, Interrent, Sicily by Car, Locauto Win Rent e Joy Rent, among other car hire suppliers in Bergamo. Goldcar, Firefly and Interrent are the major low-cost car rental companies operating at the airport. Their offers are likely to come up on top of the list when searching for cheap Bergamo Airport car rental deals on Cartrawler. Although the price is often very inviting, do make sure to compare also rental conditions, as sometimes those may be less competitive than in case of more expensive offers. Low rate often means considerably more expensive additional services (GPS, baby chair, second driver, etc..), less advantageous fuel policy or mileage limitations. Also the excess and thus also the security deposit are usually high in low-priced offers. Regardless of the car rental provider, it is always recommended to read carefully the rental conditions in order to determine whether the offer is ideal for the purposes of the trip. Bergamo Airport is the northernmost airport of Italy, only 1.5 h drive from the border with Switzerland and also not far from borders with France, Austria and Slovenia. If you are planning to travel to any of those countries, or even further, to Croatia, in your rental car from Bergamo Airport, do check if rental conditions allow cross-border travels and to which countries. During the high season, the cheapest rental cars at Bergamo Orio al Serio Airport are usually available from about £120 for a 7-days rental of a small city car, typically a Fiat 500, an Opel Adam, a Fiat Panda, or similar. This type of a car is a practical solution for one or two on a city break in Italy, as a cheap and easy to park run-around. Groups of 3 or 4, people with large amount of luggage and/or travelling long distances will be surely more comfortable in larger and better equipped cars. The difference in price between mini and economy class is often insignificant which makes renting a Fiat Punto, a Ford Fiesta, a VW Polo or an Opel Corsa a much better solution. At the other end of the scale, and for those who wish to travel in style, are luxury rental cars which in Bergamo Airport come in a great variety. Audi R8 Spyder, McLaren MP4 or the Italian supercars Ferrari California, Maserati Granturismo and Lamborghini Huracan are just some of the premium cars to rent in Milan-Bergamo. Maserati Granturismo – the amazing driving experience in an open top supercar. The majority of premium hire cars at Bergamo Airport is provided by the Italian company King Rent, which specializes in luxury rentals. There are, of course, little or no savings to be made when renting the most expensive cars on the markets. Be prepared for a very high excess and security deposit which will often require more than one credit card to cover. Direct flights from UK to Milan-Bergamo are available with the low-cost carrier Ryanair, with departures from Bristol, East Midlands, Edinburgh, London-Stansted and Manchester. Sports car hire Milan. Bergamo Airport distance to Milan. Maserati Granturismo rental. Ski resorts near Bergamo.